Here are your most Frequently Asked Questions (FAQ’s) for riding at Shetland Pony Club. We hope you find them useful. 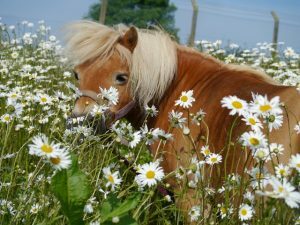 Do you only have Shetland ponies? Yes. We specialise in Shetland ponies as we have years of experience in working with them and very young children. 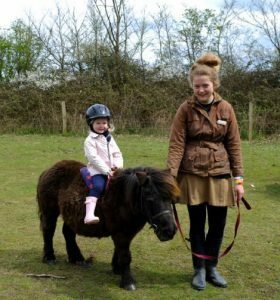 We have miniature Shetland ponies suitable for children from 2½ – 6 and Standard Shetland Ponies which are bigger and can be ridden by children aged 6 – 10 years old depending on their height. The maximum height for children is five feet one inch and weight seven and a half stone. What age can children start? Children can successfully balance on a pony from age 2½. We recommend children begin with a Starter Ride. Our ponies can take children up to about age 10. Starting at a young age can result in the development of a secure natural riding seat but perhaps more importantly early happy memories will sow the seed of love of ponies. Our aim is to introduce ponies in a relaxed and natural setting so that it is fun, safe and easy for everyone. Please note two and a half years is the minimum age. No exceptions! No. We are quite different from a traditional riding school in that we hope to recreate the experience of owning your own pony. Our experienced staff will introduce you to owning a pony and help you take your first all-important steps with horses. Our ponies are lead rein ponies suitable for beginning on. We are approved by the Association of British Riding Schools and operate to their standards in a natural environment with a fun based ethos. Can I ride off the lead rein? Lead rein riding is where your pony is led and controlled by a helper walking alongside your pony. Children must remain on the lead rein and will be accompanied by our staff for their safety. Our pony share members can work towards riding off the lead rein under the instruction of Julie Cousens, our British Horse Society Certified Instructor. Do you do riding lessons? Our club introduces children to the basics of being around and riding ponies. 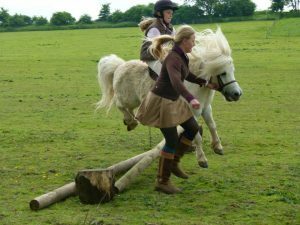 Our pony mornings and pony day camps are educational and fun but are not formal lessons in an arena. We ride in the open meadows on the lead rein. It is easy and fun for all. 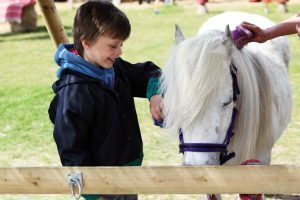 Formal lessons are available to our pony share membership scheme children only and taught by a qualified instructor when the children are ready to move on and learn to ride off the lead rein and jump. I am not “horsey”… does it matter? No. Our club is designed to encourage everyone to get to know ponies better and enjoy being with them. Our experienced staff are there to help you every step of the way. Riding will open a whole new world of outdoor fun up for you and your child. 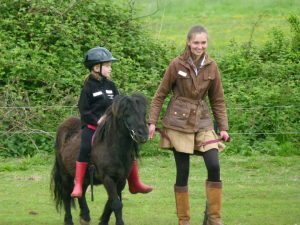 We run short home study pony courses for parents to help your child start riding. You must be aware that although our ponies are well trained, riding is a risk sport and ponies can sometimes bite, kick and be unpredictable. Your child may slide off the pony when riding. Care must be taken to see that they do not tread on your toes. 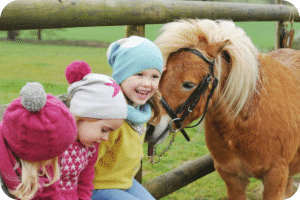 We take every care to minimize the risks and teach the children how to be safe around ponies. We are covered by public liability insurance and licensed annually by Elmbridge Borough Council. We are approved by the Association of British Riding Schools and operate to their standards. Our senior staff are also DBS checked and are trained in first aid and child safeguarding. We are members of the Equestrian Employers Association and Charter Members of the Children and Nature Network. Children will be given a safety talk before riding our ponies. Hard hats are provided to the latest safety specification and we use safety saddle pads for beginners with no stirrups to ensure that they cannot get caught on them. We supply hard hats, which we have specially selected for size and comfort for small children. Body protectors are not required for riding Shetland ponies. Riding boots or stout shoes are recommended. We use saddle pads that do not have stirrups to ensure that children cannot get caught on them. Wellington boots or trainers are fine. A waterproof jacket and leggings are a good idea. Adults should wear wellingtons or comfortable shoes for walking in the fields. Can I leave the children with you? Children may be left with us for camps if they are aged five and over. We recommend that children age two and a half, three and four are accompanied by their parents. I’m an adult, but I love Shetland Ponies. Can I come and visit? Yes, we have Shetland Pony Walking for adults. 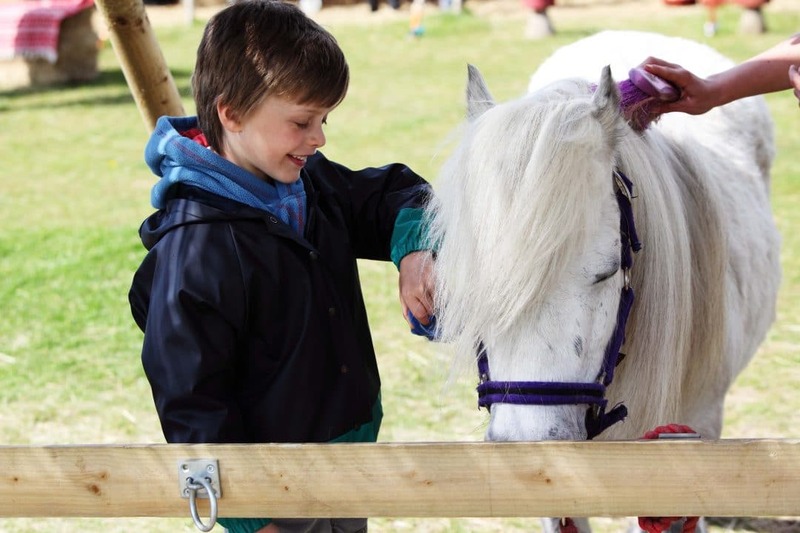 It’s the perfect way for grown-ups to enjoy Shetland ponies in the lovely Surrey countryside. 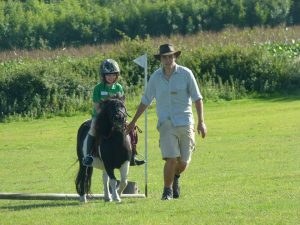 Come and spend time, enjoying and leading your very own Shetland pony. Yes. We are very busy and all rides are booked in advance. You can book online or by telephoning the office on 07734 950 309 or 01372 844077. Payment is required at time of booking. PayPal and all cards are accepted. We do ask that you have an appointment before you visit the ranch as we cannot usually accommodate drop ins. We do go out in all but the very worst weather. Wear wellingtons and a jacket. If it is pouring with rain or there are high winds we will rearrange the session for a better day. Is it fun for boys? Yes! We encourage boys to ride and find they benefit greatly from the secret bond formed with their pony. Boys respond very well to our outdoor approach and really enjoy riding the ponies in the fields as opposed to pressurised lessons in a school. We like to encourage boys and show them that learning to ride could open up a whole world of fun for them too. Can special needs children ride? Yes. Special needs children are very welcome and we have many who come to us. Please call the office to arrange a quiet time to come and talk your needs through with our staff. We love dogs but Shetland ponies do not! Please leave your dogs at home or if they do come they must stay in the car with an open window. Sorry, but our insurance does not allow dogs to be with the ponies.